This documentation is for Monolix Suite 2016 and later. Mlxplore is an application for the visual and interactive exploration of your models, designed to be intuitive and easy to use. 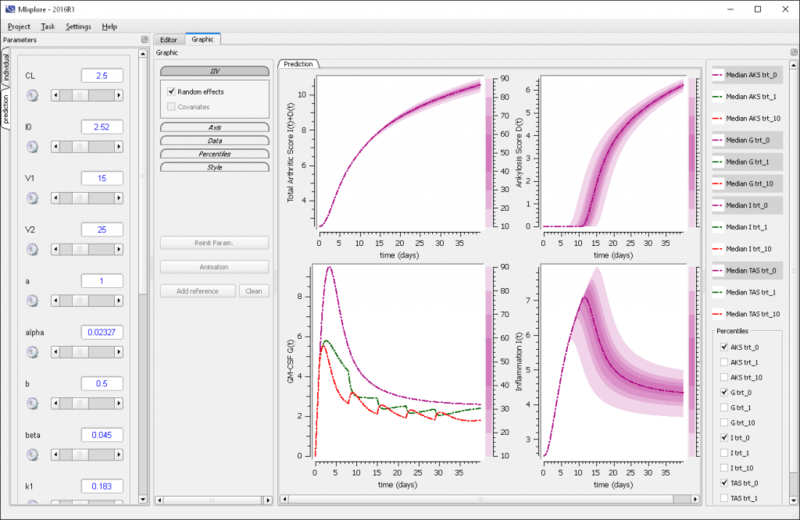 It is a powerful solution for daily modeling work as well as for teaching and sharing PK/PD properties or for real time dose-regimen exploration in front of an audience. Mlxplore also allows you to visualize the statistical components of the model, such as the impact of covariates and inter-individual variability. Mlxtran is used for custom-built models; a simple, yet powerful model language that is suitable for simple PK as well as complex Systems Pharmacology models. Mlxtran contains a set of macros and keywords for PK/PD models. Treatments and administrations are specified as Mlxtran code. Mlxplore offers an easy-to-use, flexible and fully interactive interface. It contains an embedded text editor with auto-help and syntax highlighting for Mlxtran language and Mlxplore projects. Models are automatically compiled in the background for lightning fast simulations. Mlxplore includes an efficient ODE solver, as well as a solver for delayed differential equations (DDE).